To be successful and fulfilled, your work life must reflect your true self, including calling upon the strengths you already possess. 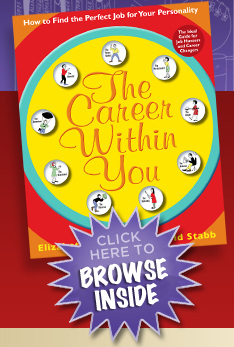 The Career Within You by Elizabeth Wagele and Ingrid Stabb helps you achieve just that. The book’s individualized approach determines your career type, then helps you forge the career path that best suits you, making it the ideal guide for job hunters and career changers of all stripes. Discover the Wagele-Stabb Career Finder, which matches your career type with specific job roles. Quiz: What’s My Career Type? Over a Dozen Free Resources! How do I determine my career type?